Ski-in/Ski-out, Internet, Newly Renovated, Pet Friendly! Newly Renovated Powderidge condominium is a definite ski-in/ski-out unit. 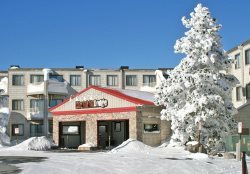 Located in the Powderidge complex, right next to Powderidge lift will make this the most convenient condo for that skiing adventure. This quaint one bedroom with Flat Screen TV, one bath condo has a fully equipped kitchen and log fireplace. Book this for your vacation today.